In the old days, a bodybuilder was not just a bodybuilder, but a strongman, an Olympic-style weightlifter and a gymnast as well. In the old days, a bodybuilder was a complete strength athlete. A prime example of the complete strength athlete was the legendary John Grimek. Grimek not only won the Mr. America twice as a bodybuilder, but he was also an Olympic weightlifter representing the United States at the 1936 Olympic Games in Berlin. Grimek looked strong, because he was incredibly strong. Grimek was squatting over 400 pounds well into his 60s. Grimek was also a skilled gymnast who could perform a number of gymnastic exercises, such as handstand pushups. These days, however, there aren't many John Grimeks running around. Over the half century since Grimek's reign in bodybuilding, the Iron Game has fragmented and become compartmentalized. Nowadays a bodybuilder doesn't do Olympic-style weightlifting or calisthenics. Crossfit is the metrosexual's attempt to bring back the complete strength athlete, but seriously, who has ever gotten big and strong from Crossfit? Men in the white-collar world think they can tap into their inner warrior by training this way. Although I applaud Crossfit for trying to popularize "functional" strength and conditioning, they take an "everything and the kitchen sink" approach to it. CrossFit is a strength and conditioning fitness methodology. Its stated goal is to create "the quintessential athlete, equal parts gymnast, Olympic weightlifter, and sprinter." Crossfit is not sport-specific and promotes broad and general overall physical fitness. Its growing popularity has been fueled by a virtual community Internet model. They include everything from Olympic lifts, to kettle bells, to calisthenics, and they plop every odd lift in the mix without any rhyme or reason. You try to be a jack-of-all-trades, but you end up a master of none and your physique reflects this. 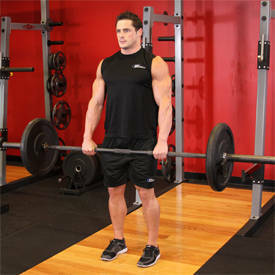 If you want to become the complete strength athlete, then focus your strength training efforts: the power lifts for limit strength, the Olympic lifts for explosive power, calisthenics for strength endurance, and interval training for conditioning. 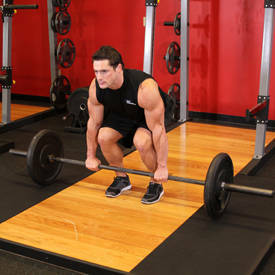 Focus on improving your performance in one or two of these facets of strength and conditioning before including more. Don't try to do everything in the beginning, because you will accomplish nothing in the end. Do this in a structured program, and you will become the complete strength athlete. When you become proficient at all four components of strength and conditioning, then you can attempt the following program. This is a combination full-body routine/split routine designed to cycle your body through the major facets of strength training. One-legged squats require a lot of practice and flexibility, but once you're able to do them, they will leave you sore in the quads. 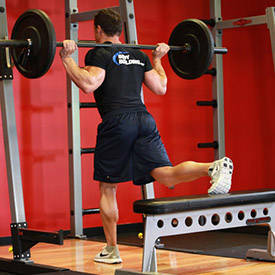 To perform one-legged squats, lower yourself on one leg while extending the other leg out in front of you. Sounds easy enough. If you don't concentrate, however, then you'll fall. If you've never done them before, then perform half reps over a bench. 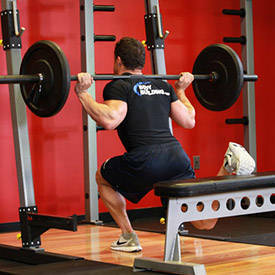 Over the course of several workouts, increase the depth of your squat. Extend your arms out in front of you to counterbalance your torso as you squat down. You do not arch your back with 1-legged squats. Round your back and your torso over the knee of the leg doing the squatting. By curling your torso over your knee as you squat to the bottom, your center of gravity stays directly over your base, which is your foot. This will help you to avoid tipping over. For each exercise, use a weight that allows you to perform the designated number of reps in good form. Do not go to failure. Once your form breaks down or the speed of your repetitions start to slow down, then it is time to stop the set. Follow this program for 3 weeks, and then substitute different exercises for each day. Just plug them into the set, rep and rest parameters. You can't play a song by hitting one note all the time, so don't be a one-note lifter. Become the complete strength athlete.